Go bold with your barware! Containing everything you need to treat friends and family to delicious cocktails, this set is a must when you're entertaining. In an on-trend dark green and brushed gold colourway, there's a definite sense of opulence about this cocktail shaker. The modern metallics combined with the etched pattern body result in a truly iconic design exclusive to VonShef. Plus, it's made from robust stainless steel to withstand even the most vigorous mixing and shaking! Muddler. Crush ingredients to release and infuse flavours. Hawthorne Strainer. Only release the infused liquid from the shaker. Julep Strainer strain your cocktail concoctions directly over your glass. 0.5oz/ 1oz Jigger. Get liquor quantities exactly right. Bottle top pourer. More convenient than unscrewing bottle tops. This cocktail set really does look the part. Neatly wrapped up in VonShef's signature giftware packaging, it's the perfect present for Christmas, weddings, house warmings and more. It also comes with a recipe guide, so the lucky owner can get started right away. Or maybe you're hosting a party or just set-up a bar in the basement, in which case... treat yourself! THE SHOWPIECE SHAKER - get the perfect blend of flavors and bring a professional touch to your drinks prep with a quality cocktail shaker. 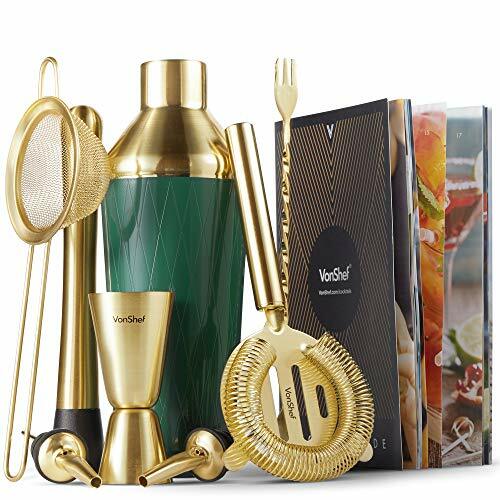 COMPLETE SET - be confident you have everything you need to make all your favorite cocktails with a shaker, muddler, bar spoon, 0.5oz/ 1oz measuring jigger, Hawthorne strainer, bottle pourer & recipe book. EXCLUSIVE TO VONSHEF - crafted by in-house VonShef designers, the dark green body boasts an etched geometric-inspired print in signature VonShef style. GREAT GIFT IDEA - if you know a budding mixologist or someone who loves their home bar, this cocktail shaker is not only a practical addition to their collection, but a stunning display piece too.